Get your website page created in seconds! 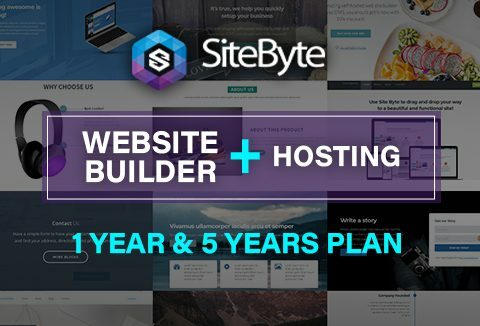 Now maintaining & designing your own website is much simpler with SiteByte. This easy-to-use drag and drop website builder comes with combinations of 100+ content blocks to create a unique website. Simply edit the website content and deploy it to your hosting account instantly! Own this fun, fresh and functional website builder with hosting for just $49. A Preview Of The Content Blocks Of SiteByte Website Builder! What Can You Do In The Editor? Edit Text Content: Click on any text element and type to change the text! it is simple and fast to edit text content. Upload & Change Images: You can swap any images with any image from your computer or set the image to a URL. Add Videos: You can add any youtube or other videos embed to the website easily. Customize Colors: All the colors are easy to edit with the detail editor. Support will be provided for account related requests. A knowledge center with video tutorials is being worked on. Support for deploying to the Droplet Hosting account will be provided. Edit the content, images, and icons easily while building your own website.